This is a show I wish they would release, or another one from this tour. This show was amazing! the setlist was perfect and the playing was phenomenal. Please release some Patrick Moraz shows. Plus, if you haven't heard Refugee with Patrick Moraz, give a listen. This was my second Yes concert. I brought my high school sweetheart. Anyway, I saw them in 1974@ Baltimore Civic Center thinking they in no way could out do themselves; I was wrong. They had really matured. The highlight was when Steve Howe played it seemed like 30 minutes of acoustic guitar by himself. It was incredible. Truly a great concert. This was the first concert I ever went to. I saw Yes in the round some years later, and Asia, with Steve Howe. I went with a friend from my eighth grade class. We sat up high in the rafters, but we saw everything. I'd been listening to Yes for years because of my older brother. I remember the ticket stub...lost it. I remember buying a concert program, hanging onto it for years, then cutting it up and putting pieces of it here and there on my wall...lost that, too. I sold all my old vinyl Yes albums, but I wish I still had them, for the Roger Dean cover art. I remember sitting up there with people passing all manner of tobacco-like items back and forth. I remember them playing Sound Chaser. I remember the close up on Steve Howe when he played the cadenza-like solo in the middle. I remember them playing And You And I, too, and seeing that steel guitar, and the double neck. This was my second time seeing Yes. Outstanding show. I also remember Jon stopping during Starship Trooper. What he said was, "Can you guys just leave? You big guys, can you just leave so we can play?" Then applause from the audience. I think he was trying to help security get some trouble-makers outta there. At the end of the show, during the standing ovation after the encore, Steve said into the mike, "But, we ARE a good group!" I was 13 and already had been listening to Yes since I was 10, thanks to my older brothers. This was my first ever concert that my mom went out the day of the show to get me a single ticket(my brothers already had theirs), thanks mom! Anyway, the show was a great show for the sole reason that they played Close to the Edge-my favorite Yes tune. Had they played Your's is no Disgrace, It would have been perfect. Section 106, row B was my ticket and one of my brothers took the seat so I did not have to sit alone. What a great memory. This was my first ever Yes concert. It was apparently tacked on to the end of the tour, because the date does not appear on the program, and this show was for some time a truly "forgotten Yesterday." Through good fortune my sister worked for Hecht's department store, which had a Ticketron outlet, and her boyfriend bought four tickets for me the instant they went on sale. A friend who had turned me on to Yes the previous summer came along as did two other friends. We knew the seats were pretty good, but were blown away when we were ushered to the FRONT ROW directly in front of Chris and Jon. After the opening act, ACE, finished their set, the lights came down and Yes came out on stage for an incredible rendition of Sound Chaser. The entire experience was just incredible, especially for a kid who had just turned 17. During parts of Close to the Edge we were completely enveloped in the dry ice fog. We were so close we could see every finger move. I do remember the crowd surging the stage during the encore, and we were pressed up directly against the stage, but it didn't get crazy or anything, just people dancing and soaking up Starship Trooper and Roundabout. I had the opportunity to see Yes another 6 or 7 times, but this will always be my favorite Yesshow! I saw this show too...it was the first concert I ever went too. We bought our tickes in Harford Mall. We left like at noon and got to the Cap Centre at like three in the afternoon. I remember Jon stopping the concert during Starship Trooper, but I think he was telling security to stop pushing people around. This was my 2nd Yes concert, as I had previously seen Yes in Baltimore in December 1974. The show was not advertised except for a few radio ads just a week or two prior to the show. I raced to Montgomery Wards in the Harford Mall to get tickets one day after work. I was working at APG and left early to get tickets. 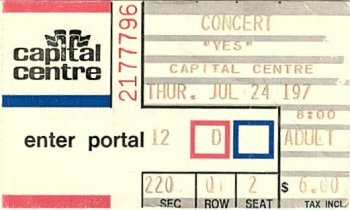 I have heard that some people question if Yes played on this date, and they did because I was there. It is where I got my first programe. I remember Jon saying after Sound Chaser that he had a frog in his throat and he would whistle the high parts. His voice was rough when he spoke but sounded fine when he sang. At the end during ST, the crowd was getting wild and the band almost stopped. They brought the volume down and Jon was pushing his hands down to the crowd as if to tell them to sit down or move back. I also remember at the end of ST they all sort of sang to to the final note or feedback, just like on Yessongs. But memories do fade. It was a great show! They had the "barnacle" stage set and it was good, but I liked the moving stage scenery from the Baltimore show. I was also upset because I had bought two tickets for Steve and myself and another frend of ours went with us and he got better seats just by getting 1 ticket the day of the show.